When Seventh-day Adventist Irene Morgan (1917-2007) refused to give up her seat as a black woman traveling on an interstate bus in 1944, the driver summoned a Virginia sheriff to arrest her. Morgan tore up the arrest warrant and resisted the officer. She fought her case all the way to the U.S. Supreme Court with the help of the NAACP’s legal counsel, future Supreme Court Justice Thurgood Marshall. 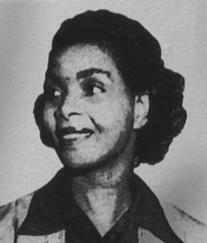 In the landmark Irene Morgan v. Commonwealth of Virginia decision in 1946, the Court ruled in Morgan’s favor, declaring that segregation was illegal in interstate travel. Morgan’s example inspired the 1947 Journey of Reconciliation in which civil rights activists rode buses into the Deep South to test enforcement of the Court’s ruling, meeting with arrests and violence along the way. The Journey of Reconciliation in turn inspired the famous Freedom rides of 1961. Adventist Peace Fellowship is an independent 501c3 non-profit organization that supports work for peacemaking and social justice building upon the values of the Seventh-day Adventist tradition. We are not part of, affiliated with, or supported by the General Conference of Seventh-day Adventists or any affiliates known as the Seventh-day Adventist Church. Any content, opinions, statements, products or services offered by Adventist Peace Fellowship, are solely those of our organization, and not those of the Seventh-day Adventist Church.